Comes in assorted colors. hookah design may change based on availability. 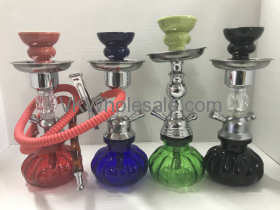 You must wash your hookah after every use, especially whenever you change flavors. Sometimes some flavors are stronger compared to other hookah flavors that can spoil or change taste of the flavor you are smoking. You must brush the insides of the metal mid-section with the cleaning kit brush. Also was the glass base after each use with warm water. Discard any water after each use. Do not run water through the hose. Simply blow into your hose after each use to get rid of the residuce build up.